The source of where the Chelsea bomb explosion came from. Chelsea bomb Explosion 911 call: Police sources claim that an individual called to say that there will be more explosions to come. Investigations underway. Assertions have been made moments after Saturday night’s Chelsea Manhattan explosion which left 29 injured but with non life threatening injuries, a 911 caller called to say there would be more bomb explosions to come. The claim according to the nypost comes via a law enforcement sources who are now taking the 911 call seriously, having now begun investigations. In the aftermath of the explosion, investigators told of the Chelsea bombing being an intentional one, although debate exists whether it was terrorism orientated (suggesting political aspirations) or the work of an individual prone to outright criminal dispositions. Either way many New Yorkers Sunday morning took umbrage with NYC’s Mayor Bill de Blasio who last night declined to specifically describe the Chelsea bombing as a terrorist act. To date no individual or group has admitted to the assault with authorities conceding they have yet to unearth what may have motivated said person or group to plant what is now believed to have been a pressure cooker device. Sources revealed that the explosive device which had emanated from a garbage Dumpster, directly below a building for the blind at 135 west 23rd st had been consistent with the device placed outside the bin. 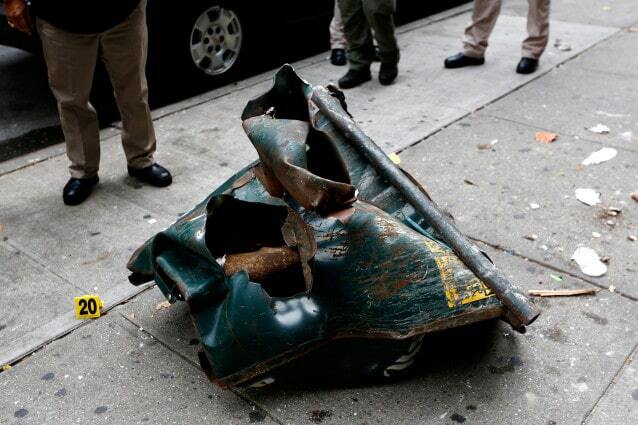 Investigators told of the blast pattern showing the metal being bent inward, where as had the device gone off inside the bin, the patterns of the blast would have shown the metal bin bent outward. 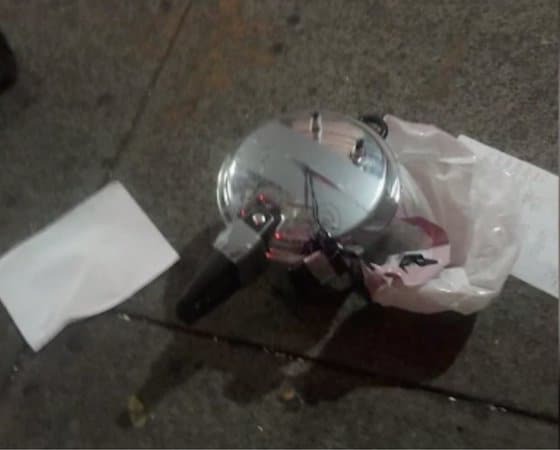 A pressure style bombing device (pictured) was found soon after on west 27th st, between 6th and 7th ave. 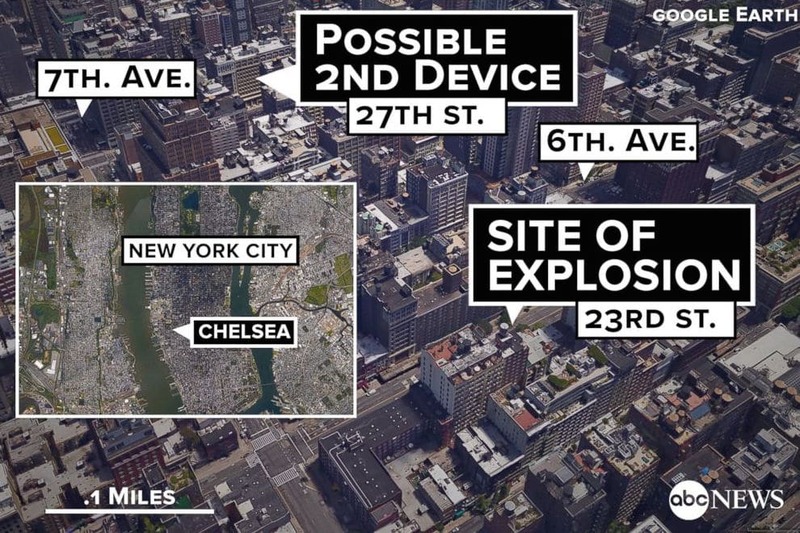 In a possible lead to Saturday’s Chelsea explosion investigators told of obtaining surveillance video of a person placing another unexploded device, a pressure cooker bomb along west 27th st. Authorities were able to deactivate that blast with no injuries or incident. That device was discovered by an older woman who’d gone outside her home after receiving a call from a friend checking in on her after the initial Chelsea blast. Authorities have yet to tell whether that device was similar to the one that went off on west 23rd, with many speculating that the explosives were likely placed by the same individual or group. Told another post which the individual described as their manifesto: ‘I did it because I cannot stand society. I cannot live in a world where homosexuals like myself as well as the rest of the LGBTQ+ community are looked down upon by society,’ one post says. To date authorities have yet to verify the validity of the blog’s claims as the blog page remains live.